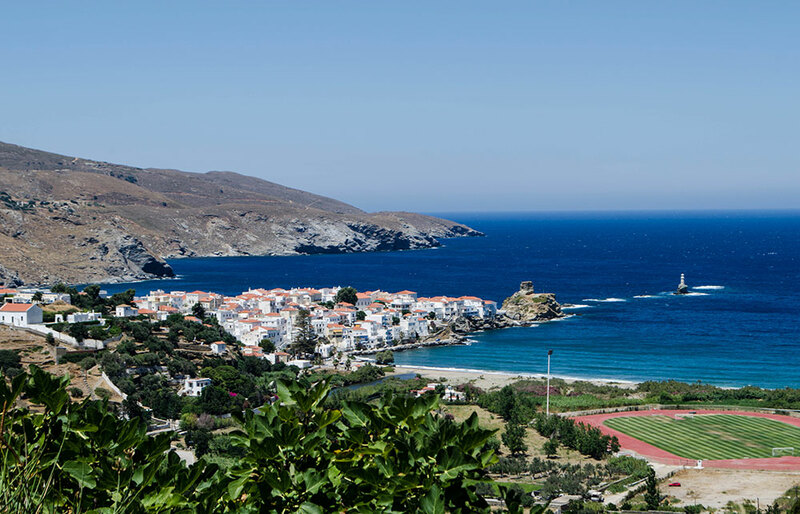 Andros is not a typical Cycladic island, but it is definitely one of the most aristocraticones.Tall trees and roof tile houses dominate over barren landscapes and cubical architecture. 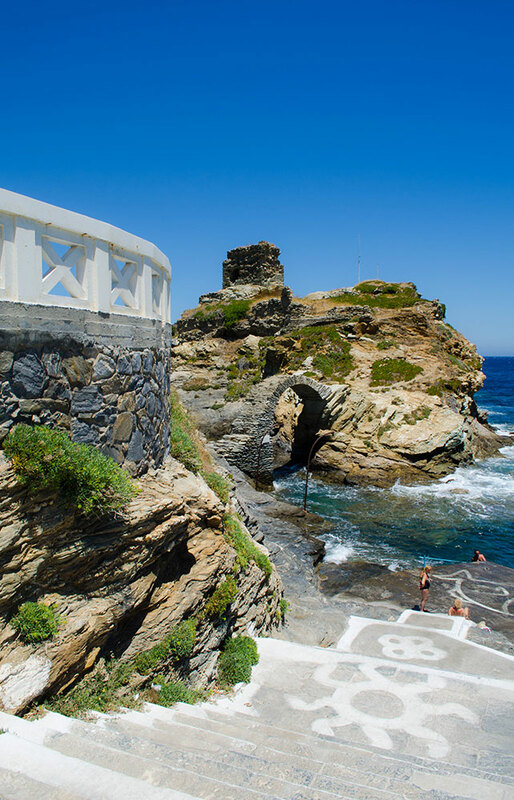 In fact, Andros is the most fertile island in the Cycladic complex. Its mountainous landscape alternates with green valleys, water springs and stunning beaches. 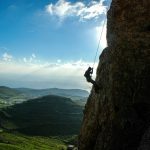 This fascinating island meets all the criteria for being one of the top summer destinations in Greece, but it can also be appealing in the winter due to its vivid variety of landscapes. 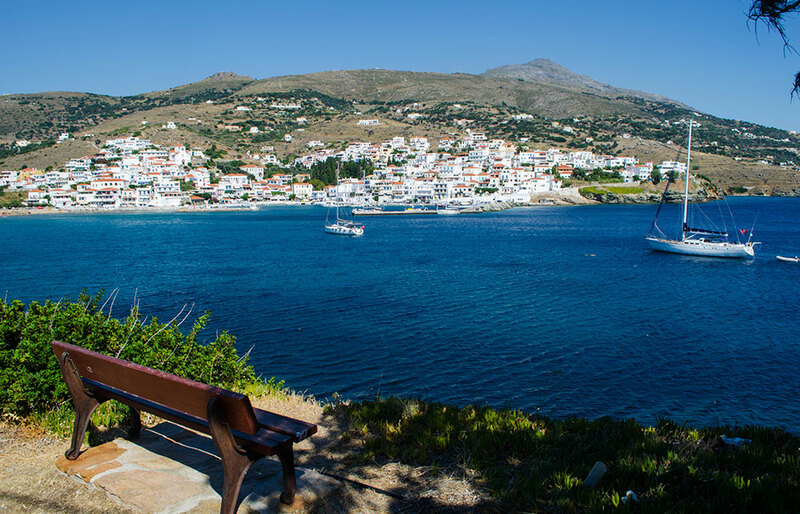 Only two hours from Athens, Andros gathers in its extent archeological monuments, lush nature, breath-taking beaches, lovely villages, exquisite museums& galleries and local delicacies. However, over the years it has preserved a lowprofile. An island extremely rich in naval history and ship-owner tradition, Andros never truly needed tourism to develop. 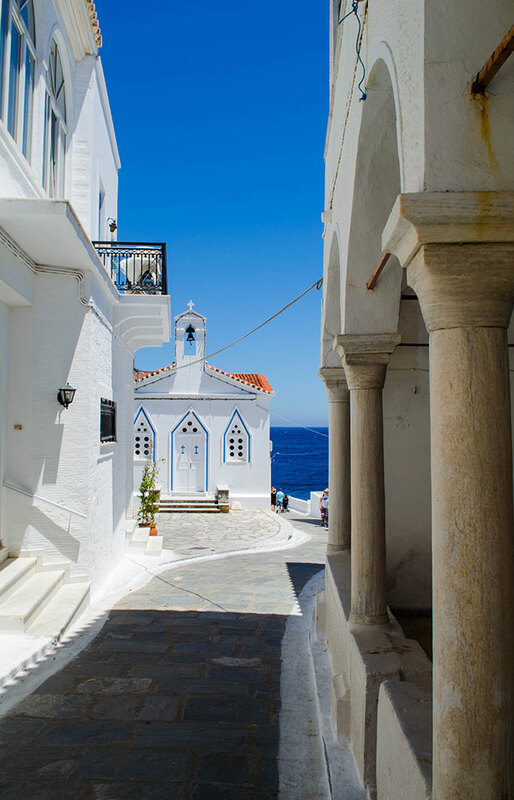 As you walk through its noble Chora, you will notice the rich maritime tradition of the island and get a sense of its gentle exclusivity, with just a few discreet hotels and traditional sweet shops. For those eager to get a glimpse of its aristocratic aura, this big, contradictory island holds such a distinct identity that will leave you talking about its rare beauty. Caste of Chora: is one of the most important monuments of Andros, located at the waterfront of Chora at the Unknown Sailor square. It was built in 1207 and was resided by the Venetian ruler Marino Dandolo. The castle was completely destroyed after the bombing of the Germans in 1943. Today you can see only its ruins and particularly memorable are the remains of its semi-circular shaped bridge. Ravine of Pythara: is located in Apikia village, just a few kilometers west of Chora. The abundance of water springs in the area creates an amazing environment of lush landscapes, small waterfalls and ponds. Rare species of plants, wildflowers, birds and aquatic life are found along the entire riverbed. There is a 10 min trail to reach Pythara. 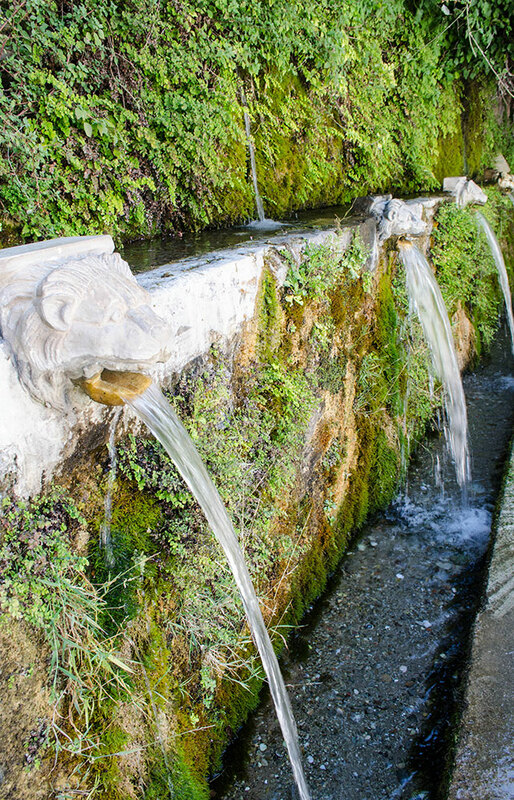 Sariza spring: is found at Apikia Village. It is considered to have healing properties and attracts many visitors. Sariza’s mineral water is also bottled and sold all over Greece. A few meters west to the spring, you will also find Sariza’s factory. Pano Kastro: used to be the strongest settlement on the island. Also known as Castle of Faneromenis or The Old Lady Castle, it was built from 1207 until 1233 by the Venetians on the slopes above the bay of Korthi. Legend has it, that the Turks sent an old lady to ask for shelter in order to enter the castle. When she entered the castle she deliberately opened the gates to the Turks and Andros was conquered. The old lady was so shameful and of her action that she jumped from the cliff and has been petrified ever since. The beach was named “Old Lady’s Leap” (ie. Greek trans. “Tis Grias to Pidima”) and the castle “The Old Lady’s Castle”. Nowadays, some traces of houses and walls are preserved. Right next to the remands you will also find the Faneromeni church. In order to reach it the castle you must climb 143 stairs, but the magnificent scenery and the view to the Aegean is well worth the effort. Monastery of Zoodohos Pigi: is the largest monastery in Andros. According to tradition it used to serve as a school during the Byzantine Era and became a monastery in 842. However, it was officially recorded as a monastery for the first time in 1400. In 1928 it was converted into a nunnery. It hosts a rare collection of holy icons, books and manuscripts as well as a museum with prehistoric tools, utensils, vessels and vestments. The monastery is located between Gavrio and Batsi. Monastery of Agios Nikolaos: is an 11th century monastery located north of Apikia. Agios Nikolaos is perfectly maintained and has a sophisticated architectural structure.During the Turkish occupation the monastery was taken over by “Filiki Eteria” and served as a printing and bindery house, as well as “Krifo scholio” (Secret School). The monastery houses a unique iconostasis, wonderful frescoes, and an architecturally superb wooden screen. Here are also kept the many relics, including the relic skull of Saint Nicholas of Vouneno is, the jawbone of St. Kosmas Aitolos, part of the skull of St. Joseph of Arimathea. From the monastery there is a footpath (30min walk) that leads to the stunning beach of Achla. Paleopolis: was the ancient capital of Andros, which prospered from the Classical to the Roman times. It is located 9 km from Batsi, almost at sea level, with its port and market which sunk. There are remains on the shore and you can also see the sunken marketplace at the sea bed. It is a great place for scuba diving and snorkeling. Excavations revealed that the city had paved roads, a thriving marketplace, a theater and some temples. Findings are displayed in the Archaeological museum of Palaeopolis. You can reach the ancient city by foot from Paleopolis’ modern village or by car. Archeological Museum of Paleopolis: is located in the modern village of Paleopolis and is dedicated to the antiquities of its ancient settlement,which was for many centuries the capital of the island. Kairios Library: is situated in the entrance of Chora and hosts up to 60,000 volumes of rare publications of great importance for Andros and the rest of Greece. Waterfalls: are found in the village of Remata, located between Katakoilos and Arni. The village is crossed by Arnipotamos and creates waterfalls in its course and small ponds with plenty of aquatic life. Chora is the capital of Andros, built upon a small peninsula between the beaches of Niborio and Paraporti, on the east side of the island. It is considered one of the most unique capitals in Cyclades, due to the combination of Cycladic, medieval and neoclassical elements. The colorful houses, wonderful neoclassical mansions, narrow alleys and the medieval gateway to the old city give Chora a distinct atmosphere and beauty. The heart of Chora also reveals the rich maritime tradition of the island and gives visitors a sense of richness and aristocracy. Monuments of interest include the square of the Unknown Soldier, the old castle and many fine museums and galleries. Batsi is the most cosmopolitan and touristic area in Andros. 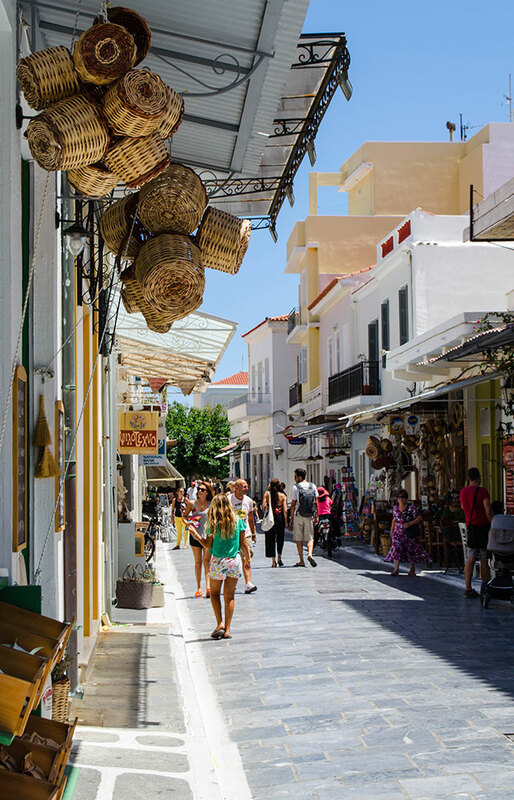 This picturesque fishing village has managed to turn into a major summer resort without losing its typical Cycladic charm. Little red tiled houses with brightly colored flowers spread amphitheatrically around its harbor. The surrounding areas offer excellent sandy beaches and unspoiled hidden covers. Most of the nightlife of Andros is also here. In its narrow alleys will find many hotels, rooms, restaurants, cafes and bars. 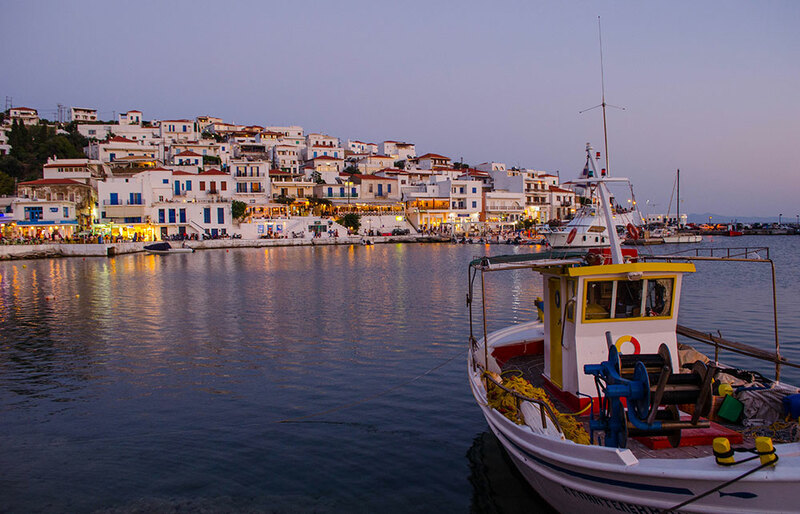 Gavrio is the port of Andros with many hotels, rooms, tavernas and shops to welcome visitors. Close to Gavrio you will find a series of highly developed beaches with many amenities especially for the water sport lovers, including sup, windsurf, kite surf, kayak, and other.Although there is not much to see in Gavrio, it serves as a starting point for excursions on the northern part of Andros and Gavronisia, seven small islets opposite to Gavrio with deep blue waters, sea caves and secluded beaches ready to be discovered by adventurous travelers. Stenies is a traditional village, on the east side of the island. Impressive old stone houses and cobbled paths, marble water basins, tall trees and colorful gardens are the main characteristics of this small village, which is built on the slopes of a hill and has a truly authentic character. Andros island has more than 50 stunning beaches with crystal clear waters for you to enjoy. On the west side you will find popular sandy beaches with shallow waters and organized facilities. On the east side you will discover secluded unspoiled beaches with deep waters. 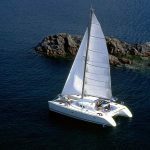 Most of these are accessible by rough paths or by the sea, and are ideal for nature and sailing lovers who like adventurousexcursions. Achla: is considered to be one of the most beautiful beaches in Andros with amazing fine sand, magnificent waters, plane trees and a creek that leads to the beach. Although the beach is not organized and is quite difficult to access,as the road is track for about 8 km, it is quite popular and attracts every summer many yacht and jet setters. The easiest way to get there is by local boat (lantza) from Chora. Agios Petros: is a long sandy beach located on the road leading from Gavrio to Batsi. Its shallow waters make it ideal for families with young children and those looking to chill. 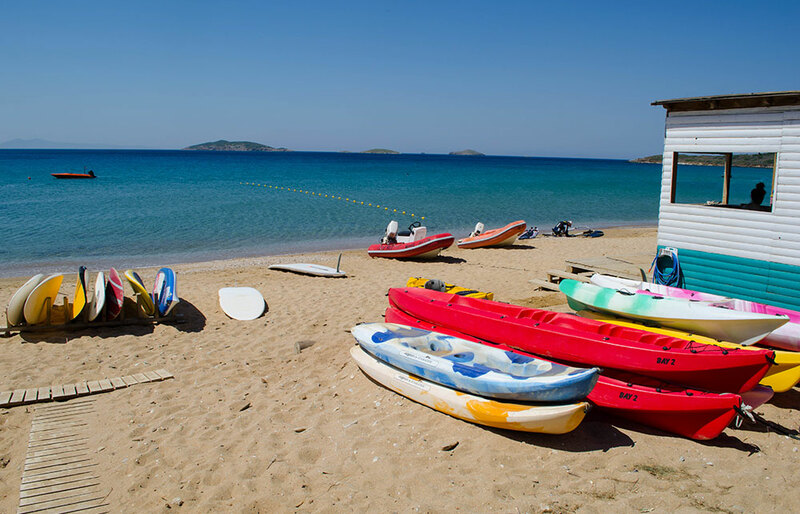 Agios Petros is fully organized with umbrellas, sunbeds, beach bars, tavernas and water sports centers. In fact its unprotected waters are also ideal for windsurf and kite surf. 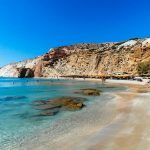 Kypri: is a sandy beach located on the road leading from Batsi to Gavrio right next to Chrysi Ammos and Agios Kiprianos beaches. 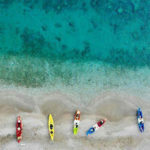 Kypri has crystal clear waters and several establishments including accommodations, beach bars and water sports center. Access to the beach is easy by car. There is a parking area available. Chrysi Ammos: is one of the most popular beaches in Andros positioned in a secluded cove and usually protected from the winds, with its long golden sand and amazing waters. It is well organized with umbrellas, sun beds, beach bar and beach volley court, ideal for those looking to have some fun. Chrysi Ammos is located on the main road leading to Batsi from Gavrio and is very easily accessible by car or bus. 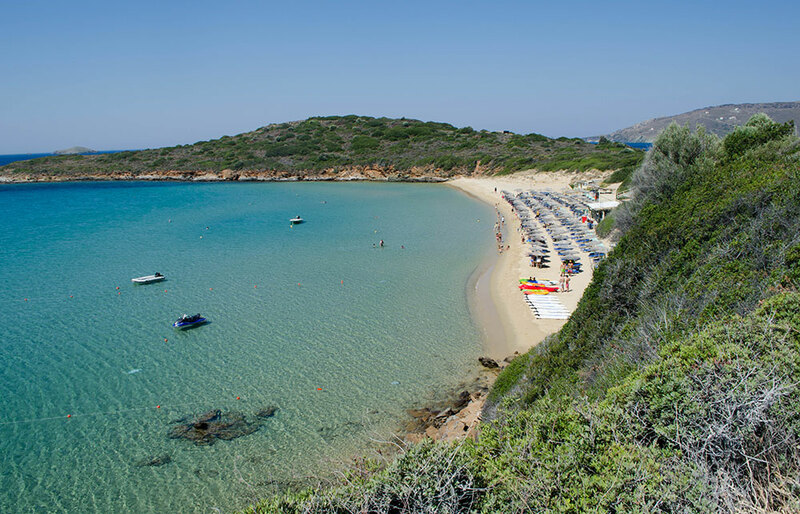 Gialia Beaches: are two beaches located in Stenies village, just a few kilometers from Chora. You can choose between Empros Gialia, which is a pebble beach, and Piso Gialia, which is a sandy beach. The beaches are only a few minutes’ walk one from another. In Empros Gialia you will find a taverna, while in Piso Gialia there is a beach bar equipped with sunbeds and umbrellas. Both beaches are rather popular due to their close proximity to Chora. Nibourio: is one of the two main beaches of Chora. It is an organized sandy beach, with taverns, shops and cafes along its coastline. The beach has shallow waters and attracts many families. Nibourio used to be the old port of Andros and still gathers many fishing boats and yachts. Andros Nautical Club is also located here. Nibourio is easily accessible on foot from Chora. 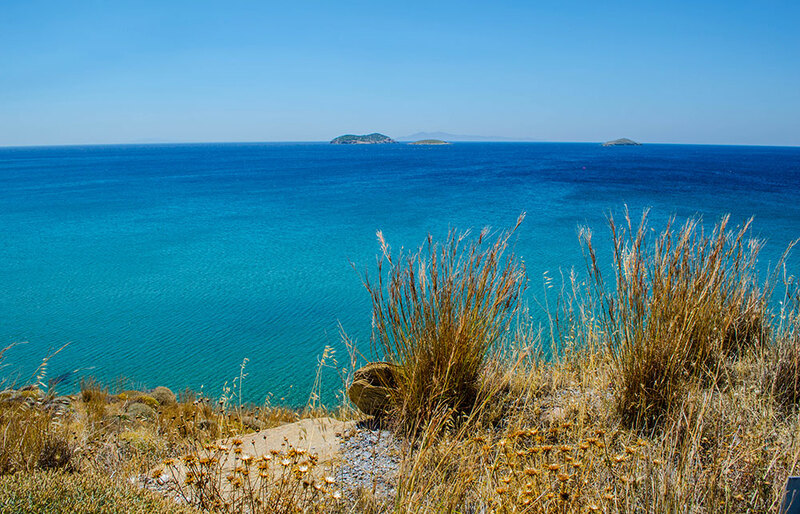 Paraporti: is the second beach close to Chora. It is a large sandy beach, exposed to the northern winds with a nice beach bar on its one end. Access is easy from a peripheral road. You can reach Paraporti by car or by foot (shortcut) directly from Chora center. Tis Grias to Pidima (Old Lady’s Leap): is one of the most famous beaches in Andros located on the southeast coast. It is a rather small beach with both sand and pebbles and emerald waters. 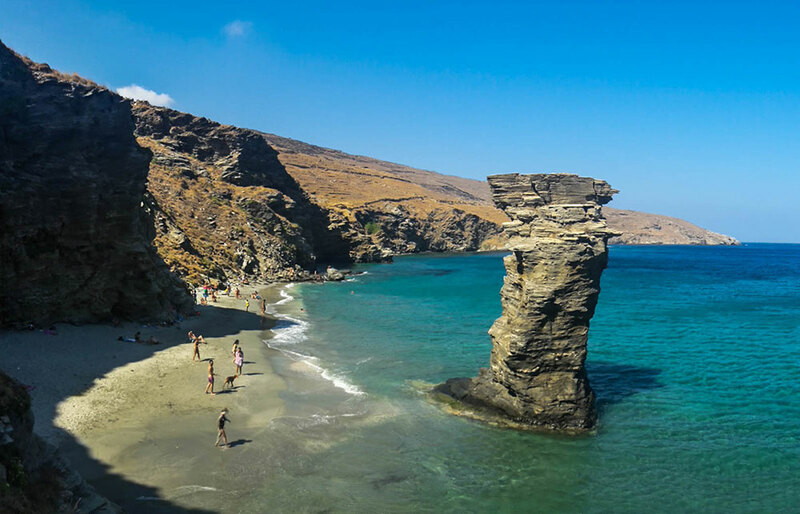 The characteristic narrow rock formation standing in the sea has made it the most photographed beach of Andros. 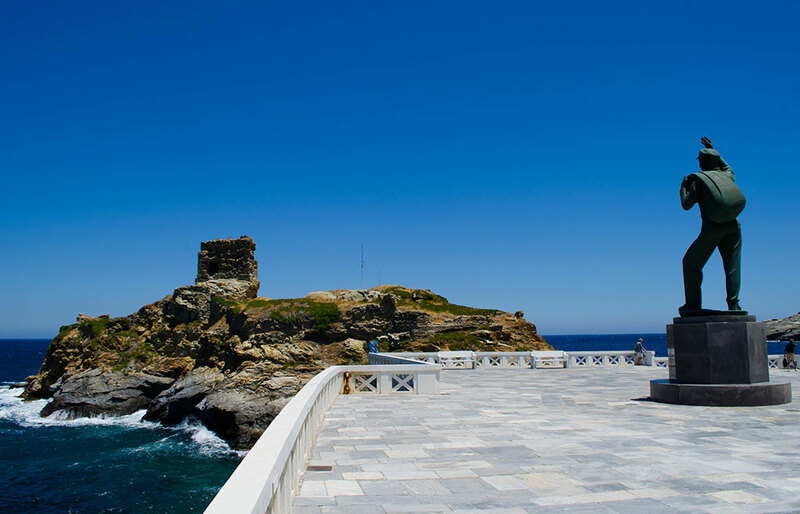 Legend has it, that the Turks assigned an old lady to ask for shelter in order to enter Andros fortified castle. When she entered the castle she deliberately opened the gates to the Turks and Andros was conquered. The old lady was so shameful and of her action that she jumped from the cliff and has been petrified ever since. That is why the beach is named “Old Lady’s Leap”. In order to reach this dramatic serene cove you must follow a 300m downhill path on foot. It will compensate you with its beauty. Vitali: is considered to be one of the best beaches in Andros, located 14km from Gavrio. It is a large sandy and pebbly paradise with crystal clear waters, small caves and big rocks providing natural shade, while surrounding rocks make it ideal spot for adventurers who like to cliff dive into the sea. Vitali offers sun beds and umbrellas, a beach bar and a taverna. Access is easy, along a path road from Gavrio. Zorkos: is a secluded beach on the northern side of Andros. It is a large beach with golden sand and crystal clear waters, ideal for those who are looking for calmness and privacy. It also attracts those who love fishing. On the beach you will find a small taverna and a few trees for natural shade. The road leading to the beach at some point turns to a track path and the access is a little challenging. Sineti: is a beach of wild beauty, deep crystal clear waters and sea caves. It is located on the eastern side of the island, close to Chora. Syneti is pretty tranquil and ideal for snorkeling, as it is surrounded by huge rocks. Due to its special morphology it attracts many nature lovers. In Sineti you will also find “Dipotamata”, a picturesque gorge with traditional windmills that ends there. According to the myth, theisland was named after its ruler Andros, son of Anios, king of Delos. However, Andros was also known as Ydrousa, due to the abundance of water, and Lasia due to the lush vegetation. Prehistoric Period: Archaeological evidence suggests the island was inhabited since at least the Mycenaean period. During the Geometric Period (9th-7th centuries B.C. ), Andros achieves great prosperity, as suggested by the findingsin the settlement of Zagora. Ancient Period: Paleopolis served as the island's capital, whose prosperity is proved by the city's coinage.Findings are exhibited at the Archaeological Museum in Chora. Roman & Byzantine Period:In 199 BC Andros came under Roman rule before passing to the Byzantine Empire (4th -6th century AD). Pirate raids were a constant threat to the island. Venetian & Ottoman Period: In 1204 AD Andros came under the rule of theVenetiansand then the Ottomans conquered the island in 1566 AD. During the Ottoman rule the island was given many privileges which led to its economic prosperity. For a short period of time Andros came under the Russian rule, as the rest of the Cyclades, and in 1821 the island participated in the Greek revolution for independence. Modern Times: Andros developed a great shipping power and in 1939 Andros was second to Piraeus regarding ship registration and the second port of Greece. Contemporary art exhibition: is an exhibition of distinguished 20th-century artists, organized every summer by the Vassilis and Elisa Goulandris Foundation in the Museum of Modern Arts. Ploes: is a music and arts festival organized by the Kydonios Foundation every summer in Chora. Gavriotika: is a five-day event that takes place in Gavrio during the first ten days of August. Festivities include athletic activities, chess tournaments, egg-racing, sack-racing, art exhibitions by local amateur artists and more. International yacht race: is an open water sailing race with an international entry, from Attica to Andros and back again. It is held on the first weekend of August. Folk dance exhibition:is held every September in Batsi. Folk dance groups from all over Greece participate in an exhibition in Batsi’s main square. Chirosfagia (the pig slaughtering ritual): is a type of celebration where pig reares and their families kill and store their pigs for the winter. This annual ritual turns into a big party with lots of local delicacies and wine.